We’ve all heard how poorly our 15-year-olds are doing in comparison with the rest of our competitor countries across the world on the PISA exams (17th in reading, 23rd in science, and 30th in math). Union detractors immediately jump on the poor test results to promote their agenda that includes the need to remove bad teachers and the stifling effect unions have in that process. It is a part of the larger effort to get rid of public sector unions altogether. The union detractors fail to look beyond the test scores and explore the detailed analysis that the OECD provides. Let’s look at all of the information and the conclusions that it leads to. Pay their teachers comparably more than the US. Provide much more and better teacher training and continuing education. Have less bureaucratic layers of authority in the system. Provide an environment that encourages teacher collaboration and mentoring. Have greater educational equity across socioeconomic levels. If these factors sound familiar, perhaps it is because the leaders of America’s teachers’ unions have been telling people these factors were important for many years now. What the report does not mention as one of the factors contributing to quality education is making it easier to get rid of bad teachers. That is because this capability is already built into the systems, both ours and our competitors’. If a superintendent legitimately identifies a teacher who should be removed from his/her position, then he can be removed. If the superintendent has a problem doing it, then you not only have a bad teacher, but you also have a bad superintendent. Those who oppose unions complain that teachers’ unions “protect” bad teachers. Not true! The unions protect the rights of people who are accused of being bad teachers and ensure that they get the due process that everyone is entitled to. In major school districts, the complaint is that the administration cannot get rid of a group of unqualified teachers. There is no such thing! There may be a group of people accused of being bad teachers, but each case is different — some better or worse than others, some more or less trainable, some more or less motivated, etc. But they represent individual cases, each of which is entitled to due process. If removing a group of bad teachers is the problem, then the system has already failed on several levels. The system needs to be capable of identifying individual teachers who are struggling to succeed long before they accumulate and form a sizable group, and it needs to intervene early in the process with several layers of professional development and mentoring. The countries that are leading the US are already doing just that. There are a several logical fractures in the argument that teachers’ unions are the problem. Let’s explore them. Claim #1 – Teachers unions protect bad teachers. Wrong! Most teachers are dedicated to improving kids’ lives. They are more committed to the students than they are to their fellow teachers. That’s not a bad thing. Bad teachers are bad for kids, so most teachers do not want to keep them around. Most teachers want to be better teachers. But the workload and environment in many school systems don’t provide the opportunity for self-improvement. There are many non-union school districts across the country. Teachers are fired at about the same rate in both union and non-union districts. Unions are not the issue when it comes to removing bad teachers. Claim #2 – The next step after identifying “bad” teachers is to fire them. Wrong! The next step should be to improve them. There is no available talent pool of qualified, motivated people wanting to become teachers that will allow us to simply get rid of “bad” teachers. It’s been tried. Many years ago – in Al Shanker’s days – the city of Baltimore issued pink slips to a large number of “bad” teachers in April and then set out to replace them with better teachers. In August, they were forced to call back a significant percentage of them because they couldn’t find qualified or even unqualified replacements. Mr. Shanker had a vivid phrase for describing this problem. He called it going deeper and dumber into the talent pool. To their credit, the union worked with the city to put in place a special probationary program that provided the under-qualified teachers the training and mentoring they needed to get qualified and become better teachers. Claim #3 – Tenure guarantees teachers a job. Wrong! Tenure guarantees a teacher due process. The last I heard, due process was a good thing. Removing a teacher from a classroom is very disruptive to the students’ education. It should not be something that can be done arbitrarily, capriciously, or maliciously. Claim #4 – Merit Pay will improve teacher performance. Wrong! In order for this to be true, you must start with the assumption that teachers are not already doing their best and therefore offering them a reward will motivate them to work harder and do better. This is a flawed assumption. Most teachers work very hard and in many cases spend their own money for classroom supplies because they can’t get them through the system. If merit pay were to be implemented, how would you determine merit? Most people admit that comparing raw rest scores is not the answer because of the differences in the socioeconomic background and educational resources available to the students. So they hang their hat on the idea of determining merit based upon student progress as measured by test scores. On the surface, it sounds like a good idea, but let me paint you two scenarios and you tell me which teacher has more merit. We assume that both teachers are working with the same basic types of students with similar backgrounds and resources. Teacher A works every day drilling her students on the academic content standards, focusing most of the student time only on those areas that will be tested. She doesn’t take any valuable class time to do field trips or other activities that cannot be directly correlated to improving test scores. At the end of the year, her students are bored and frustrated, but they show a far-above average gain on their test scores. Teacher B designs her instruction around the broader, complete curriculum, not just the tested areas. Her students do a community service project, take field trips, and enjoy creative activities like art and music. At the end of the year, her students show an above average gain on their test scores, but more importantly, they were engaged in their learning activities and want to do more.Teacher A may have shown more “merit,” but I want my children to be in teacher B’s class. Here’s the rub. It’s easy to objectively measure the merit of teacher A. Measuring teacher B’s merit is much more subjective and labor intensive. It requires creating and using a comprehensive set of observational assessment rubrics. I’ve always liked the Mark Twain quote, “I never let my schooling interfere with my education.” In our example, teacher A was focused on schooling, while teacher B was more dedicated to education. There’s another major flaw in the merit pay concept. Students are not influenced by just a single faculty member at a school. Effective education is a team sport. To continue the team metaphor, there is an expression in sports, “There is no ‘I’ in ‘Team. '” This means that in order for a team to function at its optimum, everyone sets aside personal, individual recognition for the good of all. In an educational setting, all of the faculty members work together to get the best possible outcome for each child. If the faculty members are competing for merit pay, that creates a motivational conflict. You, as a teacher will be more interested in making sure that the student does well in your class, instead of working for the student’s overall educational improvement. If you are a teacher raising a family, then the team you will be most loyal to is your family, not the student’s support team. Merit pay, in most cases, puts the teacher in a conflicted state that is not slanted toward the student’s broader benefit. Being the lead teacher for your grade level. Each of these types of activities is a recognizable, quantifiable body of work that can be rewarded based upon some objective criteria. Claim #5 – Teachers get the summers off so they should use that time for continuing education. Wrong! Because of relatively low salaries, many teachers work a second job in the summer to pay their bills. Rather than being envious of the perceived number of vacation days that teachers and other public servants get, the workers of America should be outraged at the few annual vacation days that non-teachers receive. The American corporate propaganda mill has convinced its workers that they need to work harder and longer than their European counterparts. Nearly one fourth of American workers get no paid vacations or holidays and nearly one-half of all private-sector employees get no paid sick days. A closer look will reveal that our European competitors have a completely different attitude. “The European Union requires its members to set a minimum standard of four weeks paid vacation (covering part-time workers as well). Finland and France require six weeks paid vacation, plus additional paid holidays. Most countries require workers to take the time off and employers to give them vacation at convenient times.” It is important to note that there are many companies in Europe that, despite these conditions, are very competitive with ours. Claim #6 – Teachers get paid too much. Wrong! The following is purely tongue in cheek, but it makes the point better than a more rational explanation. If I had my way, I’d pay these teachers myself-I’d pay them babysitting wages. That’s right-instead of paying these outrageous taxes, I’d give them $3 an hour out of my own pocket. And I’m only going to pay them for five hours, not coffee breaks. That would be $15 a day. Each parent should pay $15 a day for these teachers to baby-sit their child. Even if they have more than one child, it’s still a lot cheaper than private day care. I know, now you teachers will say-what about those who have 10 years of experience and a master’s degree? Well, maybe (to be fair) they could get the minimum wage, and instead of just baby-sitting, they could read the kids a story. We could round that off to about $5 an hour, times five hours, times 20 children. That’s $500 a day times 180 days. That’s $90,000…HUH?!? Claim #7 – Teachers don’t deserve their retirement packages. Wrong! People who are interested in breaking the unions have launched a misleading campaign implying that teachers (and other public servants) get a much too large contribution to their retirement from the state/district and those retirement funds are breaking the local district and state budgets. Now let’s look behind this veil of half-truths. Over the years, teachers have negotiated to receive compensation for their efforts, just as all other workers do. That compensation includes their immediate pay plus a set of benefits. Those benefits include healthcare and retirement, among other things. Unfortunately, but not the fault of the teachers (or other similar public servants), the local district occasionally decides to “defer” allocating the money from their annual budget to pay for their share of teachers’ retirement. Teachers pay their contribution, but the district does not. When the money is set aside and wisely invested, it earns compounded interest. However, when the payment is deferred, the debt also accumulates a compound interest. Well, as the saying goes, those chickens have come home to roost, and the states and districts are faced with paying retirement costs that they neglected to set aside the money for. Now they are portraying the teachers unions as the greedy bad guys. Not so! Everyone agreed to the plan for creating a teachers’ retirement fund. It’s unethical and disingenuous for the politicians to be blaming the teachers for expecting the government to live up to the contract it agreed to. Even if the district never missed a payment, it made a commitment with its employees. Let’s look at the situation from a different angle. Let’s say that Lockheed signs a contract with General Electric to purchase 50 jet engines. The contract calls for the engines to be delivered in three years and the payment will be made over six years. (Lockheed points out that they will not have the money until the engines are installed in new aircraft so they need six years to pay GE.) GE delivers the engines as per the contract, but the economy takes a downturn so Lockheed says they can’t afford to pay the full price. Does anyone believe that GE should not be paid in full for their engines? Of course not! The teachers’ contract was for services, not a product, but the same principle applies. The teachers agreed to take their payment spread out beyond the period of service delivery – i.e., into their retirement. The teachers delivered so the buyer is obligated to pay. In addition to getting rid of bad teachers, critics of the present system want to build more charter schools. Advocates of charter schools use the US student performance on the PISA report to justify their position. However, there is a better set of data in the PISA report for understanding the potential impact of charter schools – educational equity. As they were originally conceived and promoted, charter schools would allow the capitalist system to use the tried and true method of allowing competition to drive improvements across the system. The idea presented was that good schools would thrive and bad schools would wither and die. They were only half right. The good schools did thrive. Unfortunately, the bad schools withered and putrefied, and are still in existence – stinking up lives and neighborhoods. Rather than improving educational equity, charter schools make it worse across the system. Equity measures the flatness of the distribution curve for student performance along socioeconomic status lines. On a bell distribution curve with the vertical axis representing the quality of the education and the horizontal axis representing socioeconomic status, a higher curve means that the students grouped together under the bell curve (within one standard deviation from the peak on either side) are being given an equal opportunity to get a high quality education. 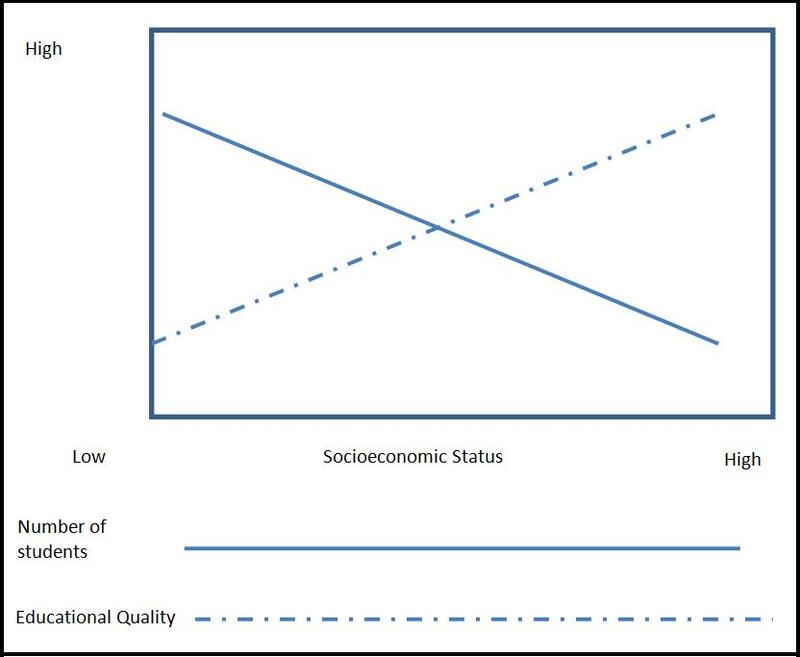 In the US, instead of a bell curve, we have a somewhat linear graph showing low quality education at the low end of the socioeconomic axis and high quality associated with high socioeconomic status. If you also take into account the distribution of wealth across the country and make the left axis of the curve represent the number of students at the socioeconomic level, the line goes from higher on the left to lower on the right. The implications are clear from the graph. America will never gain ground on other countries until we make quality education widely available to everyone across the socioeconomic spectrum. Once again, most of the countries ahead of us (and there are many) group the vast majority under the central portion of the bell curve and provide much greater educational equity across socioeconomic strata than the US. And these are the countries against which we expect to compete. The US model of funding public schools from local property tax revenues is the major factor contributing to the establishment and continuation of this inequity. Charter schools cannot fix this problem, and for the most part, they contribute to it. The previous argument assumes that a charter school is better than the average public school. Not so, according to the data. Charter schools usually get “above average” students from the district – if only because the pool from which they are randomly selected is skewed because the students or their parents must apply for admission. This simple characteristic skews the applicant pool. So how can we use this information? The healthcare industry is frequently cited as analogous to education, so let’s consider a parallel instance in healthcare to create a metaphor for what this PISA data means. We will consider the existing big hospital healthcare provider infrastructure as analogous to the existing K-12 public schools; and privately run clinics as analogous to charter schools. If private clinics, 17% of the time, provides better results, and 83% of the time, the same or worse results, do you think there would be a national clamor to provide more private clinics? Of course not! So, why all of this irrational demand to allow more charter schools? Now let’s continue considering the charter school option from another perspective. Let’s, for the sake of this discussion, assume that we could wave a magic wand and it would ensure that every charter school would be better than the average public school. In that case, it would be unconscionable to allow less than 100% of the public schools to become charter schools. Does anyone believe that the total elimination of public schools as we have historically known them is a good idea? Of course not! We have over 14,000 autonomous school districts and about 133,000 public and private K-12 schools across the country. Our challenge is not to eliminate them and replace them all with charter schools. The challenge is to transform them into student-centered schools where every child receives a continuously engaging, customized learning opportunity. There is a lot of money to be made operating charter schools. Some people are raising money ostensibly to help students, but the real target of the severest critics of K-12 education is to break up or decrease the importance and influence of teachers’ unions – and raise or make lots of money. Neither of these options is a positive step toward transforming the public schools. I am working with a dedicated team of veteran national leaders on a comprehensive program that will truly transform America’s K-12 public schools. The model will work in either a public or a charter school and has the support of the teacher’s unions. Our K-12 model school has been in operation for ten years in Tracy, California, with outstanding results. It is based upon a selected set of proven, research-based, student-centered and organizational best practices integrated into a cohesive system that operates within the district budget. It’s time to stop blaming and profiteering. Public education is too important to be used as a pawn for personal political gain or corporate profit motives. We all need to stand behind truly transformational programs that engage all students and provide them all with the knowledge and skills they will need to prosper in this global economy. districts when making their complaints and ignore those with balanced rules. A more uniform due process across the country would help everyone. On the subject of charter schools, he again makes many good and valid points, some of which I’ve argued myself. However, I’ve learned one thing about charters that is not mentioned by his analysis. They do occasionally innovate in ways that the regular public schools do not. I have personal experience with situations where the charter school adopts a new and exciting technology, and the regular public schools do not. Because one such charter school has a huge footprint in its state (not New York) and because over 80 regular public schools in New York City have adopted this technology, it’s not a fluke. Seven years have elapsed since this situation began and still not a single regular public school in the state has adopted this technology. This case illustrates why charter schools were put into the mix in the first place. It was not to replace all existing public schools. It was to allow new and different ideas a chance to be tried out and tested in the real and tough world of public education. The point of this exercise comes from the reticence of public schools to try out new ideas. This educational conservatism is often a good thing that slows the adoption of poor ideas. In a time of rapid technological change, it has become not so good. The next steps were to include watching these charter schools and dropping those that did not perform. Those that succeeded were to be analyzed and the best ideas taken for use in public schools. As a place for trying new ideas, charter schools provide an excellent platform. The Tracy Learning Center (TLC) where we have validated our program is a charter school. Being a charter school allowed us the flexibility to extend the school calendar (day and year), empower the teachers to operate the school, get rid of textbooks, and in general implement our comprehensive program of integrated, research-based, proven, student-centered, and organizational best practices. But it is important to point out that everything we did at the TLC was done with the constraint that it had to be capable of being implemented in every public school across the country. We were using the model as it was intended, as a test-bed for innovations that could then be used in public schools. Our plan is to provide educational equity by transforming public schools, not replacing them with charter schools. The face of education in the nation is contentious. There is the federal government, the state government, the regional interest or not in education, the local school board, and then we filter to the administrator at the local school, tempered by the supervisors. Local pundits? Maybe? The difference in different places of the learning landscape is also stirred up by the press. We hear about the people the press thinks as great educational leaders, but the ideas they have are influenced by a number of factors. So if you go to the worst place in the US to demonstrate your leadership and succeed for a while, are you the best of all the rest? Washington DC is a city of eternal compromise in education in that the congress has oversight, influence, and holds the key to their ability to change, transform and be successful. It is a pity that the reporters did not dig deep during the time of the coronation of M. Rhee to see the reality of the schools, the state of technology, the lack of professional development and the actual place in which the curriculum was lacking. But should reporters know all of that? They don’t have to. We don’t make them accountable for their mistakes. There are places on the map of learning that are not succeeding because of neglect. The same kind of neglect as in Washington DC but without the oversight (or the money which seems not to make a difference in the long run). Some of the wars in curriculum still go on and on and … we don’t teach geography? How is that possible? I was teaching STEM when it was called SMET. Lots of people are still not teaching science. It is not tested. Hello! Survival, salary and suspicion weigh in. Maybe there are so may prophets that no one can understand the reality of the face of education. As long as we continue to under educate, to provide this sort of education to many of the students in our nation we will continue to sink to the lower levels of appraisal in the assessment of educational policy. While watching the videos on the Civil War I was moved to think of people like Allan who want education for all, a level playing field. I was moved to think of those who came from slavery and were able to press on, of those who came to America and were able to follow the dream and be successful. But there are still too many who are confused by the conversation in education, and the local application of whatever it is in that geographical region , and decide not to embrace learning. We teach them the wrong history and they may not think they can succeed. Maybe in dancing with the stars, or some reality show but not in real life. I fear that we lose teachers who could be empowered to be passionate about teaching and learning through unusual machinations that create a dragnet of disbelief… and they go to another place to work. The politics of school… amazing at every level. Transformation of a real kind is needed. Interesting that someone queried me about this post. what is different about the way in which he would transform.. I know a lot about this. Transformative is , the use of integrated curriculum which I think the school has, that at this time is vetted by teachers with administrative support. Transformative is the synthesis of reading , writing and thinking in time blogs that lead to effective integration of thought and analysis of reading and writing. Transformative is the use of teams and student teachers, parent volunteers in a K-3 group that creates individualized learning to fit the needs of the student. Transformative is school projects that allow for the involvement of students in a community college, or college program while attending high school and getting college credit for it, some students finishing high school with many hours of classes and comfort in being in a college setting. These are just a few of the ones I can speak to.